Now of course there is some downside to this model, unlike in the ‘old-world’ where you could continue to use a historic version of the software which you had purchased forever (albeit ‘at your own risk’) even if the product was no longer for sale or the company had ceased trading – that option no longer exists. Now the quid-pro-quo for the removal of the upfront investment is that you accept it’s just a rental – and either side can end it. This seems fair enough to me, and the growth of SaaS illustrates that the model works for many. 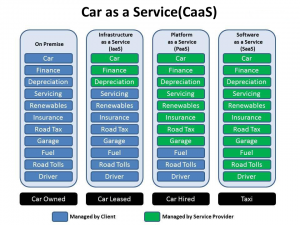 But what about when then models get blurred – when you buy a widget/appliance which had an upfront cost, but which depends on software which is available as a service? This make quite a lot of sense for manufacturers keen to see recurring revenues, but who have to cover costs of delivering hardware to users, the trouble is as we learned yesterday about the shutdown of Revolv from Nest (Google) when a business is acquired (or a strategy materially changed) customers can be left in the lurch having bought a device which doesn’t just not-update, is doesn’t work anymore. The software(as-a-servce) is gone, the life-blood is drained. This is certainly the sort of thing which will serve as a cautionary tale to buyers, and make it harder to for new companies to get going – but I hope it will make avoid this sort of mix up – services may be auxiliary to a device but they cannot be essential to it. I imagine in smart homes that over time the hardware will be commoditised and users will be able to run a range of smart home apps on their systems (enter Android for home). Hullabalook Ltd is a company registered in England and Wales with registration number 10039228. Hullabalook is a Registered Trademark of Hullabalook Ltd.